Featuring plump pieces of strawberries drenched in sweet syrup, these strawberry preserves make a delicious and versatile addition to your pantry. Reminiscent of homemade preserves, this sweet, yet tart spread is the perfect ingredient for any recipe! Whether used as a pie filling, or to top off other delectable pastry and dessert creations, these strawberry preserves will give your recipes just the right amount of sweetness and a deliciously homemade taste. Make traditional shortbread tarts or irresistible strawberry shortcakes! Beyond dessert recipes, these preserves are perfect for enhancing glazes, sauces, and fruity marinades. Offering the sweet and subtly tart taste of wholesome strawberries, these mouthwatering strawberry preserves are a must-have ingredient! These sweet, summery strawberry preserves feature rich red color, semi-smooth texture, and lush berry flavor. Conveniently packaged in a generously-sized 4 lb. glass jar, your cafe, hotel, or catering service is sure to be in good supply of these high-quality preserves with delightfully fruity taste. The strawberry preserves are great and makes a great filling for our cupcakes. The preserves are sweet and have a great strawberry flavor and taste. Taste like homemade strawberry jam and there are bits of the strawberry in the jam too. Our guests love using this jam and we've had great comments not to change the brand. Great for peanut utter and jelly sandwiches, or on some butter toast, these strawberry preserves will definitely satisfy. And in a FOUR POUND jar, they're sure to last you a while. The Strawberry Preserves are delicious and really a great bulk buy for our bake sales. Great for scooping out into our smaller serving containers. A great quality preserve. Carriage House Strawberry Preserves are great for peanut butter and jelly sandwiches, or jelly sandwiches on their own. The strawberry preserves have a more viscous texture as well. The strawberry preserves are great and perfect for our large jelly dispenser we use during catering events. The strawberry flavor is great and everyone loves them. 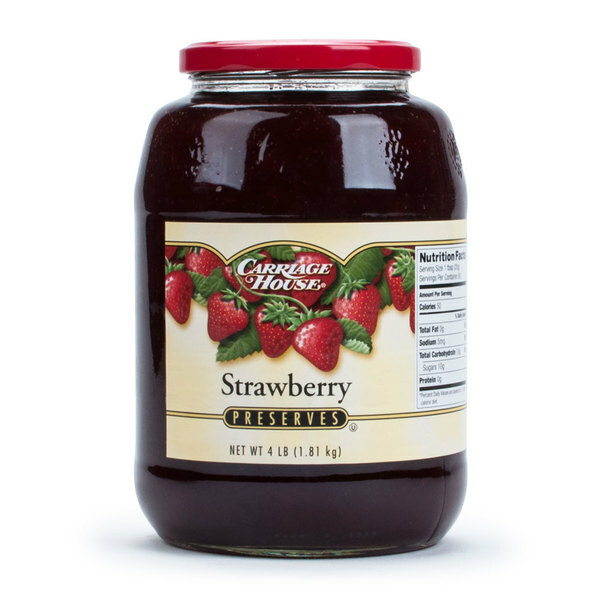 The Carriage House Strawberry Preserves is a delicious preserve that can be used as a filling for pastries or for peanut butter and jelly sandwiches. It also tastes delicious on bagels with cream cheese. A really nice and flavorful strawberry preserves. It works really nice as filling in our pastries and cookies. It is also a must on peanut butter and jelly. Tastes great! Arrived in expected condition. Still have some, using for peanut butter and jelly sandwiches. Probably wouldn't buy again, on account of what happened to the marmalade. When your family goes through several jars of strawberry jam a month from peanut butter and jelly sandwiches, it can get expensive buying it from the grocery store. Webstaurant nails it again by offering great products at affordability in sizes that are practical for families too, not just restaurants! The quality and flavor is always on point (this is very comparable to Smucker’s strawberry preserves) and I love knowing that I’m using the same stuff that restaurants use at home in my own kitchen. This strawberry preserves is great. Taste of nature in the jar! Sweetness is just perfect and it is so thick! Price is great too! Anyone will love this product! 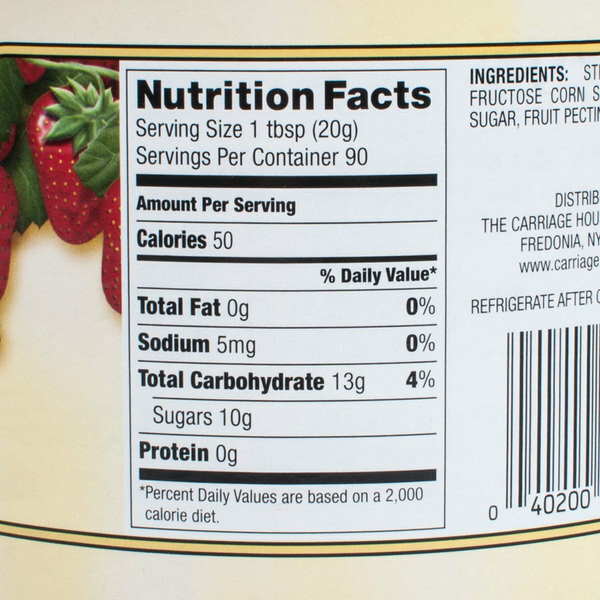 Strawberry preserves is a classic and popular flavor for jams and jellies. This has numerous uses. I can be used on toast, in muffins, and on peanut butter sandwiches. Carriage House is known for it's great preserves. This strawberry preserves is perfect for a sweet pie or cake. Definitely should be in everyone pantry. Tastes just like a smuckers. Came with a seal so that the lids can't come undone which is nice. Would definitely order this again if needed. These strawberry preserves have a fresh strawberry flavor and are delicious in my strawberry buttercream that I make to fill my cakes. I like that it has great color and really adds to my buttercream. Customers really love this strawberry preserves because I go through a lot! Nice full strawberries, and no off taste. Lasts a long time, love that they come in large jars. I am very pleased with this Strawberry preserve. It is loaded with lots of strawberries. It is definitly serves and looks like a preserve and not a jelly. We use it in our gourmet bakery and most customers love it on the side with their croissants.